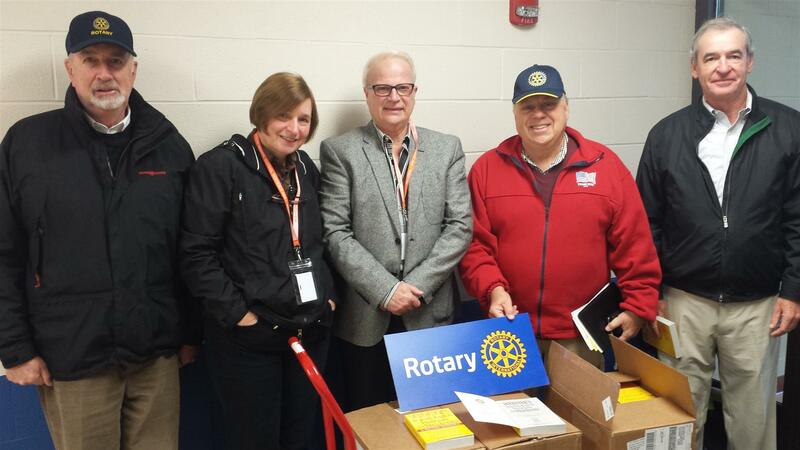 Dictionaries arrived last week, and Project Chair TERRY DESMOND - along with JACK MEIERHOFF, GEORGE ESPLIN, JOHN SWAINE and Highland Park Rotarian KAREN DENNIS - delivered them to Oak Grove School in Highwood. Thanks to MARC MUNDER for also helping out and for taking pictures! This week former Noon Club President and more recently District Governor ELLEN YOUNG talked to us about the wonderful and deserving world of the Rotary Foundation. November is Rotary Foundation Month, and we all need to know more about this great organization. Last week DON ARNOLD, Executive Director, Safe Water Kenya, was here to tell us about his important programs, giving us an update on Safe Water Kenya's partnership with Kohler and their water purification system, Kohler Clarity. BOB KENEHAN was our Program Host. Next week there’s NO MEETING due to the Thanksgiving holiday. TWO WEEKS FROM NOW we’ll welcome the High School MADRIGAL SINGERS with their seasonal sounds! Nice front-page story in last week’s Lake Forest Leader on KAYE GRABBE, getting ready to retire after 28 years as Lake Forest Librarian. Way to go, Kaye!